The touch screen interface is easy to navigate and consumes very little battery life. All your essentials are available from the home screen, seen here to the right. Continuous monitoring of ECG, SpO2 and Heart Rate. An audible "beep" can be heard whenever a heart rate is detected. Over 12 hours of battery life means you can monitor several patients from intake through recovery before recharging. 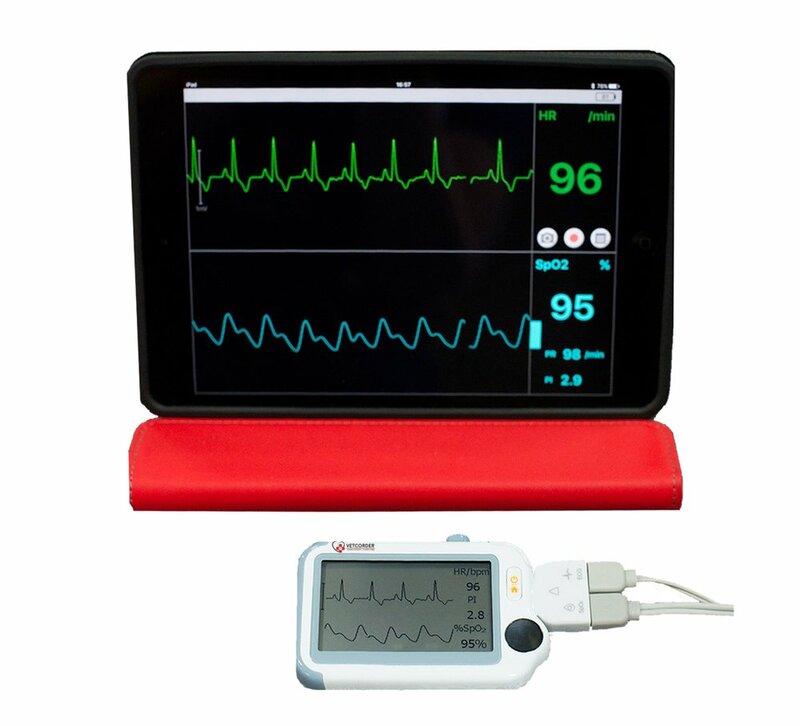 While using Monitor Vitals, you can connect to a tablet with the Vetcorder Monitor app to view a larger screen. This enables viewing of patient vitals up to 30 feet away, a low-cost telemetry unit. A 30-second recording of ECG and SpO2 saved under a pet file that includes name, weight and age. Take many recordings of an individual patient over a longer period of time, whether in the hospital or at a patient's home. An on-board temperature sensor allows you to take quick readings at a moment's notice. Simply select the "temperature" feature, hold the sensor to the pet's ear, push the button and wait a few seconds for the reading to complete. All recorded data can be transferred to our mobile application via Bluetooth 4.0 technology. Once connected, you can download the data and view measurements from Daily Checks as a daily, weekly or monthly trend. Please sign up here to learn more. An email verification will be sent to you, followed by a personal message from one of our team members.